Last week, I did a segment on HuffPost Live about multiples. It was a conversation among six women, each of whom had been touched by twins in some way. Of the six, two were a set of twins themselves, utterly lovely and unambiguously delighted with their twinhood. The point of the show was to discuss the challenges inherent in having two babies at the same time, but the presence of these two adults turned the table on the argument: raising twins is a different creature from being a twin. I find this heartening. And also worrying. The unique bond that twins potentially share is the carrot dangling in front of the flummoxed parent of multiples. For me, as the mother of two two-year-olds, it is the prize looming in the distance, visible yet slightly out of reach. The difficulty of having twins is front-loaded. You stumble through the incapacitating pregnancy, the early months of sleeplessness, the first years of snatching and biting in the hope that it will give way to something grander: a relationship more intimate, a relationship more profound than the one between consecutively spaced siblings. Does it always work out like this? Every pair of twins is distinctive, just like every singleton, but there are two broad categories into which they all must fall: identical or fraternal. Identical twins come from a split embryo. They may have small variances in appearance, in face shape, in height, but their genetic make-up is fundamentally the same. Fraternal (or sororal) twins, on the other hand, arise from two separate eggs and two separate sperm. They are as different from – or as similar to – one another as any siblings can be. Their twinhood is contingent not on a commonality of DNA but on the fact that their mother happened to ovulate twice. Or on the fact that more than one embryo was transferred into the uterus of a woman undergoing fertility treatment. Which one was what one, and what one was who. My twins don’t have this problem, they never will. They are as un-twinny as it gets. And not just because they are a boy and a girl. They have different colored eyes, different colored hair, different skin tones and completely different temperaments. They have always appeared to me – and maybe this is more revealing of my mindset than the reality of the situation – as two singletons who by chance spent nine months in my womb together. When they were born there was no twin synergy in our house through which one baby would mystically soothe the next by its mere presence. Quite the opposite: they settled better and slept better when they were separated. The only power they seemed to hold over each other was the ability to wake one another up, even through closed doors. Now, as toddlers, they are undeniably close, but the closeness often manifests itself in violence. They fight in a way, with a frequency and ferocity of temper, that shocks me. Is this the stuff of a ‘special’ bond? Now Todd (on the right) was the happier one. He thought being twins was a whole lot of fun. could tell him from Tadd. But Tadd (on the left) . 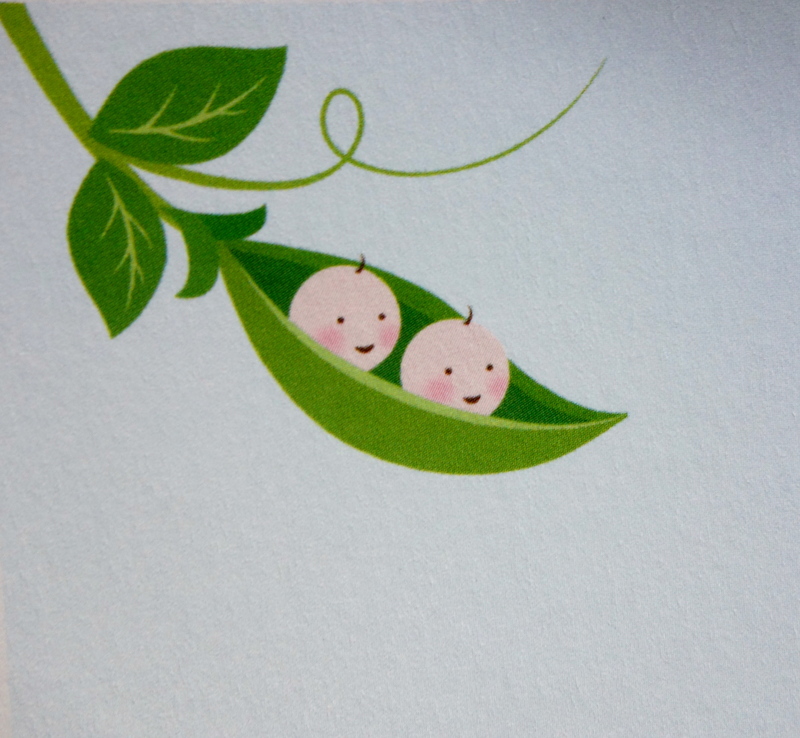 . .
Peas in a pod is exactly the image I picked for my twins’ birth announcement. It represents everything magical and harmonious about having two babies at the same time. I am increasingly aware, though, that it is a wish and not a given. I’m sending this to all my twin and multiple parents. Is there a link to the huff post live segment? Thanks! I’ll attach the link. I could read hundreds of pages on this. I know the mythical twin story makes for a better dinnertime chat, but the truth of the matter is I think you got the better situation. They ARE two different people. All the ways that will encourage people to treat them that way – as individuals and not part of a set – are positive to me. But it’s tricky and you put it out there in such a beautiful and heart tugging way. Thank you so much for your comment, Carinn, I really appreciate it! I’ll admit that I did want them to be fraternal when I was pregnant and you can’t really know for sure unless you find out gender in utero, which we didn’t. My thought was exactly the same as yours: if I am going to have two more children, I wanted two genetically different children. And yet, I am slightly envious of the people I know with identical twins. Whether by coincidence or not, their babies seem to have an innate connection that mine are lacking. Or maybe they just aren’t reporting all the fighting…;). What a great essay and love the pea in the pod image. I do think moms of “singletons” like me (I have four) are fascinated by the concept of multiples. Meanwhile, how sweet that your dad commented! Thank you so much for reading it! I want to hear more about your four singletons – I often wonder what that configuration would be like as compared to mine – so will look forward to checking out your blog. I like how my dad *signed* his comment ;). Thank you for this post! My 18-month fraternal girls are as different as can be (in appearance and temperament) and I wonder too about that special bond they are supposed to have. They sleep much better in separate rooms (separate floors even! ), and I resisted that as long as possible, wanting to believe so much in the “mystical soothing” you mentioned. We are due with our second set of fraternal twins (both spontaneous) in September and I think I will be able to adjust to their individual needs a bit more quickly this time around. Who knows, maybe this set will tolerate each other a bit more? We also have a singleton, nearly three, who seems to prefer one twin over the other. So if anything, we are seeing a stronger bond between those two than the twins. I agree that much of the fascination with twin culture revolves around identicals, but how lucky are we to have two distinct, unique individuals who are more likely to be treated as such, not just by us but by others as well? Stumbled across this article elsewhere, but I will be coming back to your blog often! Thank you so much for writing in and sharing your story! Amazing that you are expecting a SECOND set of fraternal twins. I think it will be incredibly eye-opening to watch another pair of same-aged siblings develop and to notice how their bond is similar to – or distinct from – the first pair. Wishing you all the best with the rest of the pregnancy (fingers crossed your body is used to carrying double the load!) and hope you will become a regular visitor here.